The Hoyle brand is named after Englishman Edmond Hoyle (1672-1769), a tutor, writer and lawyer by trade. He was best known as an expert on the rules and strategies behind card games and board games including chess and backgammon, memorializing the common phrase "According to Hoyle". Hoyle cards were originally printed by Brown & Bigelow (established in 1896), the first company to own the rights to the Hoyle brand. Their first cards were printed in 1927. 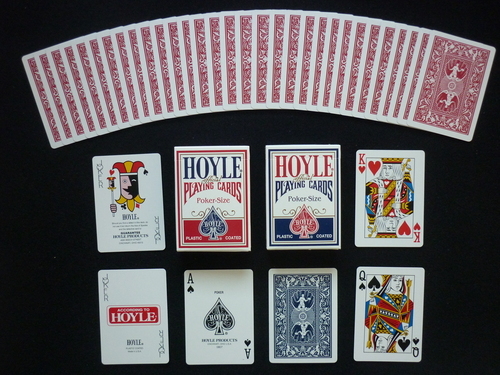 Hoyle became such a strong brand name that after 1975 their playing card division's name was changed to Hoyle Products. Hoyle Shellback cards are embossed and plastic coated.